The newly released version of the Fedora Linux-based operating system will be the first to incorporate desktop virtualization capabilities, the Fedora Foundation announced on Tuesday. The Red Hat-sponsored organization has released the first public beta of the next version of its Linux-based operating system, Fedora 14, nicknamed "Laughlin." With this release comes a bevy of new programs and features, some of which may make their way into Red Hat's own (RHEL) Red Hat Enterprise Linux OS. Most notably, the release will be the first version to fully incorporate Red Hat's VDI (virtual desktop infrastructure), called SPICE (Simple Protocol for Independent Computing Environments). This software will allow Fedora to host virtual desktops that can be accessed over a network. "In the long term, Spice will let Fedora provide a better user experience in desktop virtualization. In the short term, Fedora gains an interesting new open-source technology that many people want to try out," the Fedora documentation states. In addition to SPICE, Fedora 14 will try out a number of new technologies as well. It includes the Meego framework that will allow users to test the Meego tablet interface. It includes a demo version of the Sugar CRM software, as well as a set of Sugar developer tools. The software also provides tools for running the D functional programming language, and a beta of Perl 6, nicknamed Rakudo Star. Laughlin, nicknamed after physics professor Robert Laughlin, will also support Intel's IPMI (Intelligent Platform Management Interface) remote server management software. It includes the next-generation services loading software called systemd, which is expected to be the default for Fedora 15, taking the place of the venerable init. 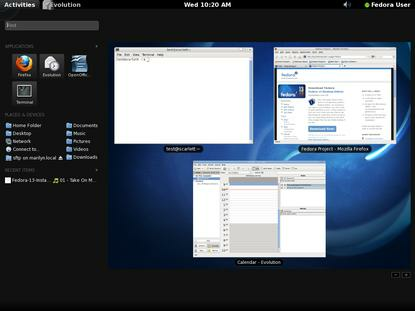 The software will offer version 4.5 of the KDE desktop and run version 2.6.35 of the Linux kernel. Red Hat started Fedora in 2003 as the community release edition of its OS, RHEL, one that could be used to test new features. Thus far, more than 20,000 individuals have contributed to the Fedora Project, according to Red Hat. Sections of Fedora are later incorporated into RHEL, as well as into Oracle's Linux distribution, which borrows heavily from RHEL. As with any beta software, Fedora will likely still have some bugs that need to be fixed, so it shouldn't be used on production systems at least until the final release. The developers are hoping that users report bugs they find back to the project so they can be corrected. The finished Fedora 14 is expected to be released in November, joining a number of other Linux distributions being updated by year's end, including Canonical Ubuntu 10.10, RHEL 6 and Debian 6.